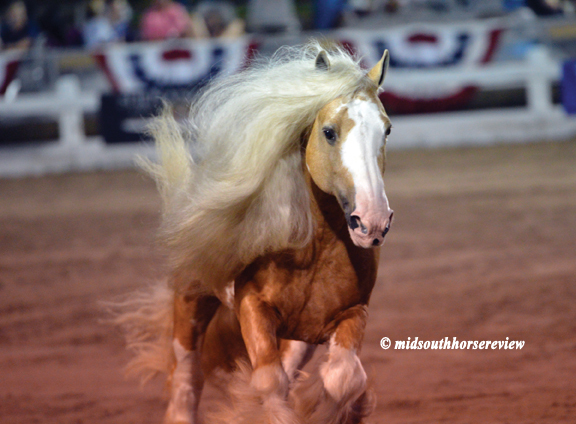 A unique feature of the Germantown Charity Horse Show is the variety of breeds that are shown. 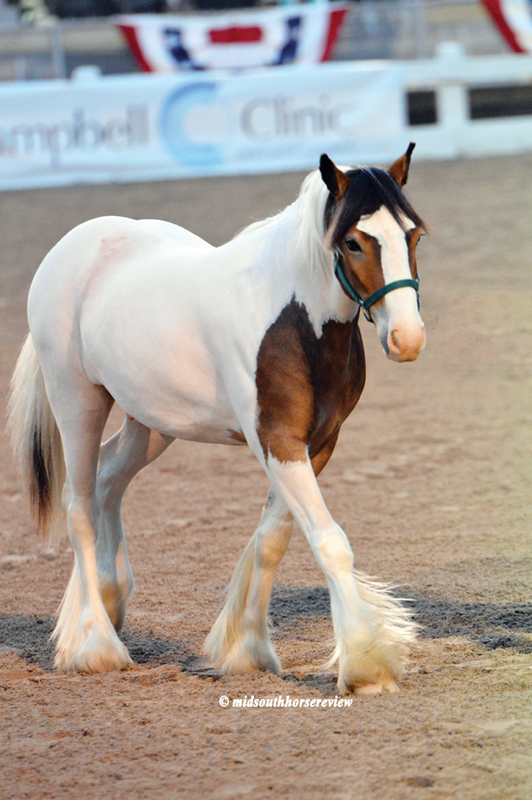 For the past several years, Gypsy Vanners have been an integral part of the show, being exhibited at liberty, in halter classes, and under both English and western tack. Tuesday evening’s performance (June 6) presented the Gypsy Vanner Halter Yearlings and Halter Mares. Taylor Hanes and Sherri Scott’s Custom Made The Bailiff won the Yearling class, with Reita Parham’s GB The Magic of Oz in reserve. 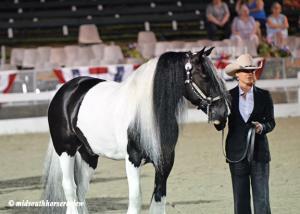 In the Halter Mares class, Samantha Crook took top honors with her GG Kiss Me Kate. Debra Rivers’ Triple R Ranch Night Raven, shown by La Salle Lewellen, was reserve. 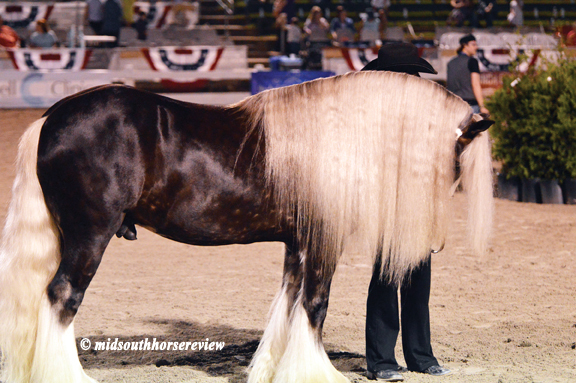 Riding sidesaddle is becoming very popular in the mid-south. Gypsy Vanners were shown sidesaddle, too, in one of several sidesaddle classes on Tuesday evening. Pixie Dust, owned and ridden by Samantha Reeves won the Open Side Saddle class, and Paulette Stoudt was reserve on Reita Parham’s GB Cushti Bok Baby. In Wednesday’s Gypsy Vanner Open English Pleasure, Triple R Ranch’s Sterling, shown by Jackie Rollins and owned by Debra Rivers earned the blue ribbon and trophy. 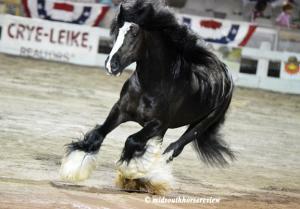 Alice Barlow on her Black Diamond Damion was reserve. One of the popular and most entertaining classes for Gypsy Vanners was Friday night’s GV Liberty Championship. The horses are brought into the area, their halters are moved, and they have the liberty of prancing and running around the arena to show off their stuff. 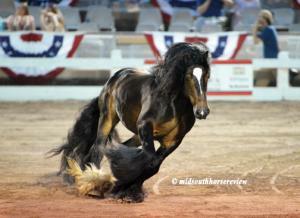 It was probably no surprise that June Villa’s handsome Romeo, shown by Taylor Hanes, won the class. Samantha Crook’s WR Maxwell was reserve. 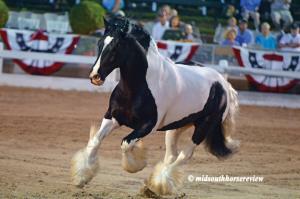 The grand finale came Saturday evening in the GV 3 Gait Championship, English or Western. 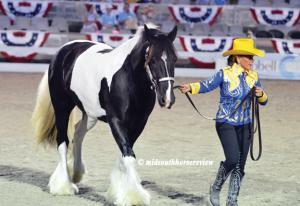 Paulette Stoudt again rode Reita Parham’s GG Oz The Wizard for the blue ribbon. 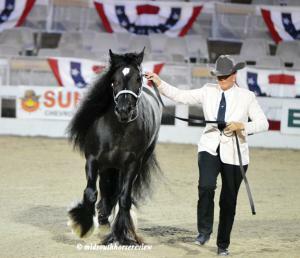 When she rode to have her class-winning photo made, Stoudt had GG bow and “wave” to the audience with his front feet.